For a while, it looked like the shuttered Woodland Park Hospital ‚Äì its jobs and services to the community ‚Äì would be saved when local owners reopened it as Physician’s Hospital. For years, Woodland Park Hospital was the only hospital in outer East Portland. After it suddenly closed a few years ago, it later reopened as Physician’s Hospital. Now, once again, the facility has been completely shut down. Word is, it will never be a full-service hospital again. The sprawling hospital campus situated on two city blocks at NE 102nd Ave and Hancock St. ‚Äì a fixture in the Gateway area for over four decades ‚Äì is, once again, dark and silent. How did this 202-bed, once-bustling medical center end up empty? Read on, and learn how, and why, this hospital has been shuttered. Dedicated in 1962 as Woodland Park Hospital, the new facility was welcomed in outer East Portland as its first medical center. The new operating rooms and treatment areas gave residents access to local health care. Its emergency room treated everything from a kid’s broken arm to serious, in-flight medical emergencies–due to its proximity to Portland Airport. Over the years, more hospitals were built in the area. Woodland Park Hospital converted a wing to become Portland’s largest medical psychiatric care center. However, the emergency room was always open, continuing to care for citizens of outer northeast Portland. The hospital’s ownership changed hands five times over the years. But some say when Symphony Healthcare, located in Nashville, Tenn., bought both Woodland Park Hospital and Eastmoreland Hospital in March, 2002, these facilities started going downhill. 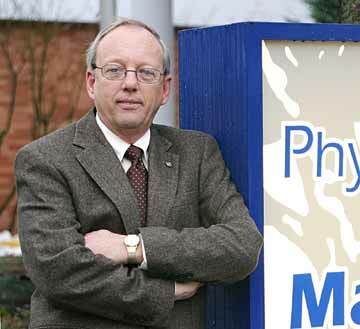 Symphony Healthcare’s Ken Perry stated, “It is with great regret that we have to close the facility due to deteriorating financial conditions.” He singled out the cost of unpaid indigent care, due to changes in the Oregon Health Plan, as the primary reason. A month after in closed, four area doctors — chiropractic physician Bryce Milan, orthopedic surgeon Tim Tribal, anesthesiologist physician Carlos Sobios, and neurosurgeon Jordy Kellogg — formed a group of local investors to buy the closed hospital’s Certificate of Need and facilities. Working with Sussman Shank attorney, Barry Caplan, the doctors formed Physicians’ Hospital LLC. They brought in other partners, secured a line of credit with GE Financial, and a $500,000 deferred loan to improve the aging facility from the Portland Development Commission (PDC). Under the first of several administrators — Kerry O’Leary, a David Douglas High School graduate — their small staff missed their projected date, and opened the hospital on Dec. 23, days before the hospital’s Certificate of Need, a governmental charter required to operate a hospital, would have expired. According to records obtained from the Oregon Department of Human Services, Health Services ‚Äì the licensor of hospitals ‚Äì the hospital was given provisional permission to open. The hospital was required to correct a long list of “deficiencies”, ranging from problems with the building to record-keeping procedures. These deficiencies kept the hospital from opening most of their beds — and with few patients, the hospital lacked the money to correct some of the more expensive problems it faced. National negative attention was focused on the hospital in July of 2005, when a patient had complications resulting from her care after surgery. As her situation became critical, her son, Michael W. Wilson, Pastor of Sellwood Baptist Church, and Chaplain of the Portland Police Bureau, later told a congressional committee that no doctors were in the hospital and staff members were neither equipped nor trained to handle the emergency. As a result, Wilson claims the hospital called 9-1-1 for paramedics to take his mother to Adventist Medical Center where she died without regaining consciousness. By the time Physician’s Hospital’s last CEO too over, Bill Houston was faced with mounting problems and too little cash to fix them. Late in 2005, another search of the state’s Health Care Licensure and Certification Section files revealed an additional patient care complaint. It also documented a long list of remaining “waivers” (physical plant deficiencies and policy shortcomings the hospital needed to fix to keep operating). On Feb. 14, 2006, U.S. Senators Grassley and Baucus requested that the federal Department of Health and Human Services inspect Physicians’ Hospital. Within a week, authorities suspended the hospital from serving Medicare and Medicaid patients, citing plant and operating deficiencies that put patients’ health and safety in jeopardy. In March, 2006, Physician’s Hospital was given 90 days to fix their problems or stop operating. The following month, Regency Hospital Co. of Alpharetta, GA, sent a letter of intent to take over the facility but later withdrew it. What about the PDC’s $500,000? The new potential owner is Mechanicsburg, PA, based Vibra Heathcare, Houston confirmed. Founded in 2004, Vibra claims to be a specialty healthcare provider, specializing in freestanding medical rehabilitation, and long term acute care hospitals. If Vibra does reopen the building, it appears as if will operate more as a medically-sophisticated nursing home than a full-service hospital. 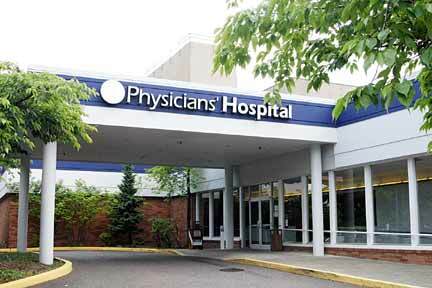 Outer Northeast Portland will forever lose its own emergency room; it will never have an urgent care center located at the facility. Woodland Park Hospital, 10300 NE Hancock (102nd Ave., a block north of NE Halsey St.) opens its doors, bringing a full-service hospital to outer East Portland. Portland Adventist Hospital, now two miles to the south, wasn’t built until decades later. The hospital’s ownership changes hands several times. Woodland Park Hospital establishes a major psychiatric care center in the early 1970s. Ken Perry founds a for-profit operating company, Symphony Healthcare, in Nashville, Tenn. and purchases both Woodland Park and Eastmoreland Hospitals. Problems at Woodland Park Hospital are reported to Oregon Health Division. Woodland Park’s psychiatric unit’s license is temporarily suspended, then restored by state regulators. Horse race to the bank: Some employee’s paychecks bounce; Symphony vows to make good on them. While the community is taken by surprise that the 200-bed hospital is suddenly closed down; employees are not. Four area doctors form a group of local investors to buy the closed hospital’s Certificate of Need and facilities. The newly renamed Physician’s Hospital holds a well-attended grand opening celebration attended by city, county and state politicians and past employees. Physician’s Hospital is scheduled to open, but does not. The hospital officially opens, days before the hospital’s Certificate of Need — a governmental charter required to operate a hospital — would have expired. It was conditional on correcting many “deficiencies” in both the building and procedures. The hospital becomes Medicare-certified. It adopts the “Planetree model”, allowing for greater flexibility in patient care. Fewer than 40 of the 200 beds are opened; no more than 70 staff members work at the hospital. Helen Wilson, 88, experiences complications after surgery. Her situation becomes critical ‚Äì a staff member calls 9-1-1 Emergency ‚Äì Wilson is transported to Adventist Medical Center. Wilson dies days later without regaining consciousness. The hospital’s last administrator admits the partners are trying to put together a multi-million dollar loan to fix problems. Authorities suspended the hospital from serving Medicare and Medicaid patients, citing plant and operating deficiencies that put patients’ health and safety in jeopardy. Medicare and Medicaid suspension is lifted, provided remaining deficiencies are resolved by May 26. Regency Hospital Co. of Alpharetta, GA, sends a letter of intent to take over the facility, but withdraws it early in May. Oregon Department of Human Services, Health Services manager, Ron Prinslow, R.N., Manager, receives notification that another potential owner, Vibra Heathcare, of Mechanicsburg, PA, desires a meeting with the licensing agency. Physician’s Hospital voluntarily surrenders its license and certification and ceases operations.